If you need to move NowSMS to a new computer, this will require a new Activation Code. You can easily request a new activation code from Now Mobile. 1.) Install NowSMS on the new computer, as described in the following section of this document: New Customer: Installing Free 60-Day Trial Version. 2.) Request a new Activation Code from Now Mobile. The Activation Code is specific to your NowSMS installation, and will not be delivered until you first send an Installation Reference Code that identifies your NowSMS installation to the publisher of the NowSMS software. 3.) 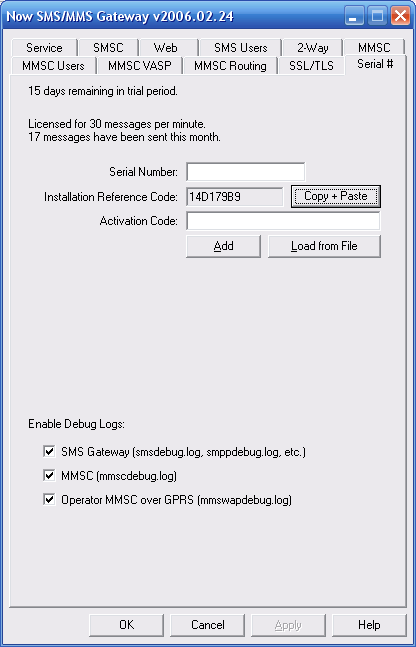 You can either wait to receive your new activation code before proceeding, or you can migrate your existing NowSMS configuration to the new computer while running NowSMS in 60-day trial evaluation mode. To apply our new activation code to the installation, follow the instructions described in New Customer: Applying a Purchased License to an existing Trial Installation.